If you’re looking for a way to be active that doesn’t include running on a treadmill, Chodat Fitness has just what you need. Our boxing classes are the perfect way for people of all fitness levels to improve their health in a fun and social environment. With professional instructors guiding you every step of the way, you can feel confident knowing that you’re in safe hands as you work towards a healthier, happier you. 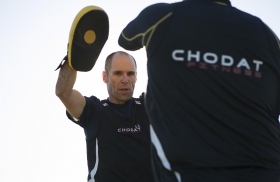 Boxing is an amazing way to get fit and healthy whilst having fun at the same time, a combination that the team at Chodat Fitness wholeheartedly believe in. As a method of engaging both your cardiovascular and muscular system, it is the perfect to way to build both strength and fitness at the same time. Along with the physical benefits, it also promotes a wealth of mental advantages as well. We want all of our clients to feel happy and safe whilst they are training with us, which is why we make sure each and every session is run by fully qualified and highly experienced fitness professionals. From boxing to personal training and our kid’s classes, we make sure to teach you the proper techniques required to facilitate safe training. We can also accommodate for people with injuries, ensuring that you remain comfortable at all times while still enjoying the benefits of an effective workout. Contact our Wollongong team today on 0431 383 411 for more information on our wide range of training solutions.